The most important part of CAT Verbal reasoning are questions based on assumptions and inferences. If you think you would rather skip this tricky topic- Well, you shouldn’t. Why? Because once you learn to tackle these well, they can prove to be the most scoring and time-saving questions of CAT. The purpose of such questions is to evaluate your reasoning skills. And you can definitely develop these. How? Just concept clarity and lots of practice! 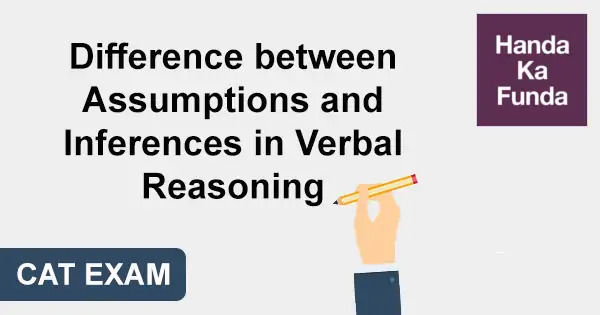 Students are often confused between assumptions and inferences. While it may not matter in case of easy questions but you need to know the difference to handle difficult questions. And CAT doesn’t really feature easy questions! But once you learn to identify assumption from inference, even the trickiest questions can be handled accurately in less time. Assumption: It is an unstated premise which cannot be logically derived from any existing information. In other words, it cannot stand on its own. Assumptions are generally given to present some new information. These can also be part of some beliefs. Inference: It is that piece of information which can be logically deducted from the one or more statements. Combination of an assumption (valid/true) and a fact results in an inference (correct/valid). You must be thinking that the difference is pretty simple. Then how does the confusion arise between the two? Well, the confusion arises because of the phrase ‘must be true’. Since neither the assumption nor the inference is stated explicitly in the arguments, it may be complex to differentiate between the two. As discussed above, inference can be logically deduced from any given information. On the other hand, assumption is a new information and can never be logically deduced from any given information. Inference must be true if the given information is true. While assumption must be true for the conclusion/given information to be true. If you see carefully, both follow opposite direction for either to hold ‘true’. As you can see, in the above question, you are basically asked to logically deduce the inference from the given set of statements. That’s the biggest hint of the answer being an inference. In other cases, the same questions may be rewritten in other ways, but the meaning remains the same. An assumption must have a conclusion while an inference is rarely followed by any conclusion. Infact, you can formulate logical inferences from given assumptions. So now, you know that there is no overlap between inference and assumption. If you examine your daily life, you will notice that it revolves around a number of beliefs (mostly assumptions), from which we draw inferences in day-to-day actions. E.g. you see a sad expression on someone’s face, you infer that something is troubling that person. Basically, our experiences lead us to make inferences as we grow. This is exactly what is required to tackle questions based on critical reasoning. All you need to do is- Think! Now you must be wondering that people make different inferences based on similar kind of experiences. E.g. While you may like a particular person’s act, your friend can dislike the person for the same. Well, there comes the role of assumptions (based on beliefs). Now, if we continually make assumptions and inferences about everything and everyone, how about learning a good strategy to handle the related CAT questions? As you would know, any CR question contains atleast one premise (information/fact). The first task is to identify the premise in the question. A good idea would be to look out for indicator words like: owing to, for example, because, since, for, as indicated by, for the reason that, given that, we know this by, etc. Premises are considered to be true without any doubt. Also, do not let your personal beliefs prevent you from identifying the correct premise. Once you have found the premise given in the question, the next step is to look for the conclusion. Conclusions are often accompanied by words like: accordingly, hence, follows that, clearly, as a result, must be that, consequently, shows that, thus, so, etc. When you know the premise and conclusion, it is easy to figure out the assumption. As discussed before, the assumption is a hidden or unstated part of given statements. Putting in other ways, it is the connection between premise and the conclusion. Basically, the assumption is that part of the statement which the author has skipped while moving from facts to conclusion. You are expected to find this missing link by utilizing your reflective thinking abilities. In case the question seems too complicated, check which option fills the gap between the premise and conclusion. This will help you arrive at the right assumption. It is better to avoid formulating assumptions before reading the option since we tend to make assumptions based on our personal beliefs and biases. A good way would be to negate a given answer choice to check if the conclusion can be arrived at or not. The above information supports which of the following assertions? What conclusion can be drawn from the evidence above? Which of the following assertions is most strongly supported by the evidence above? Which of the following conclusions can most likely be drawn from the information above? Stating it other way, it is a logical conclusion based on the facts, stated less directly. The statements given in the question often make use of jargons and appear complicated to students. In such a case, it is best to rewrite the ideas/information in your own words. This will make your task easy. An inference can never be a direct line from the given passage. It should rather follow from the given facts/statements. An inference is not a restatement of any of the information/statements. E.g. if the statement is: ‘Meera is happy’, the inference cannot be: ‘Meera is not sad’. Extreme answer choices should not be chosen. The selected answer should lie within the scope of the passage. You should not assume anything unrelated to the given statements. An inference is drawn with respect to reader/observer/listener. Additionally, you can always use the elimination strategy if you are not able to spot the answer easily. Statement: When bears are injected with certain chemicals (A and C) they start showing erratic behaviour. Inference: Chemical injections are not good for bears’ behavioural patterns. Conclusion: If particular chemicals A and C are given to the bears, they will always display erratic behaviour. Also, conclusions may be stated in the given passage (directly/indirectly) but an inference is never stated in the passage. As you know, the inferential questions feature in RC as well as Verbal reasoning section, it is crucial to pay special attention to learning the right approach for it. Now you are well aware of the strategies to handle two of the most important type of questions in Verbal reasoning. Let’s take an example to understand the difference better. Say, Lara and Diana are having a conversation regarding some homework they received the previous day. Lara: Yes, of course! Do read it. If you have any doubts, I am sure she will help you. Diana: But, how do I get in touch with her? Do I have to wait until next week’s class? So, now you know the difference between assumptions and inferences. The next step is to apply these concepts and strategies and invest a good amount of time in practicing CR questions from previous year CAT papers and mock tests.